In this video I interview John Jantsch, founder of Duct Tape Marketing and author of the books Duct Tape Marketing and The Referral Engine. John shares great tips for small businesses to get more out of social media. He also identifies the key social media trends to focus on to make your marketing simple and effective in bringing in more money. Be sure to check out the takeaways below after you watch the video. Also keep reading to learn how you can win private coaching with John. Connect with John on Twitter @ducttape and check out John’s website: Duct Tape Marketing. Want FREE private coaching with John Jantsch? 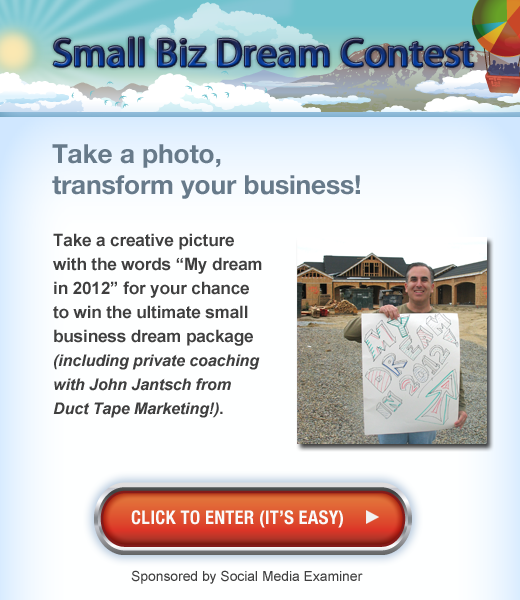 Check out our Small Biz Dream Contest. Do you have a small business? If so, how do you use social media to market your business? Please leave your comments below.